The one characteristic great leaders share is the constant desire for self-improvement. Good can always be better. These weaknesses and threats are called blindspots because they are invisible to the individual but have the potential to wreak havoc on one's reputation and long-term success. Identifying and fixing crucial problems is the leader's job, and sometimes the most debilitating problems are with the leaders themselves. 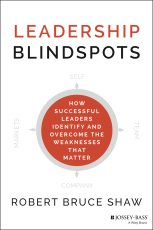 Leadership Blindspots is the first step toward owning and addressing one's vulnerabilities and, as a result, becoming a more effective leader.